For a person, like me who hardly wears sneakers besides some converse, and some red Nikes. I am obsessed with colorful sneakers of all kinds. I love them, I love them, I love them! When people wear them.. I'm just like dangg I really like that and it looks supa fresh. LOL. Anywayss before I go off on a tangent, haha rangent = random tangent lol, Today's been a long day. 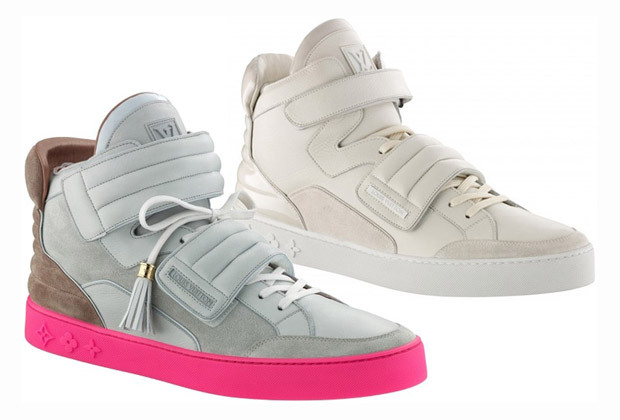 I just wanted to post some pics up of Kanye's sneakers for LV that are already sold out! They are pretty nice. Check it.